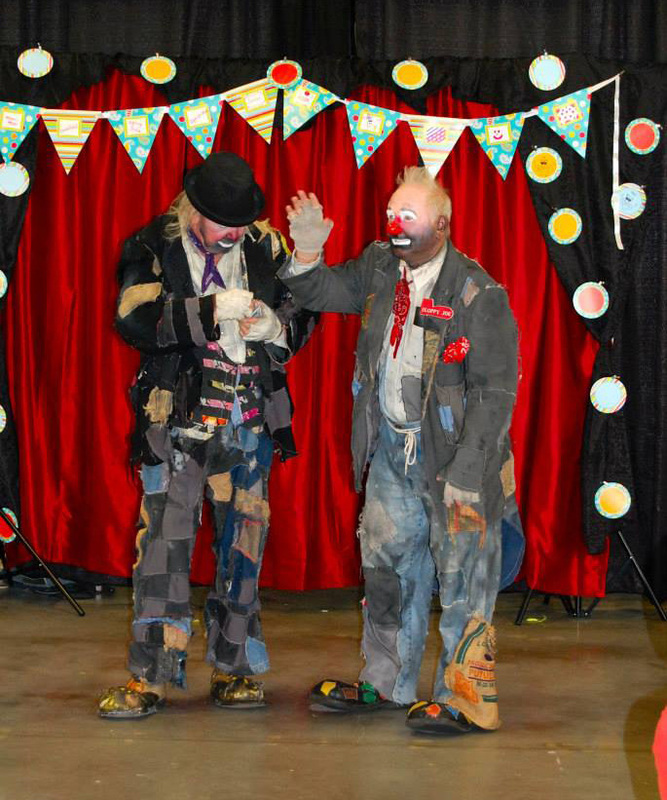 Taking a year off from our annual clown school this year to re-tool our alley with more fun clowning activities, nursing home visits, events and parades! For more information, please don’t hesitate to contact us! Some exciting new changes coming for this year’s Fun World Clown School. Shoot us an email at our “Contact Us” link to be put on the mailing list. As soon as we have the details we’ll let you know! 2017 CLOWN SCHOOL REGISTRATION IS NOW OPEN! It’s time for our 2017 “Introduction to the Clowning Arts” Clown School! 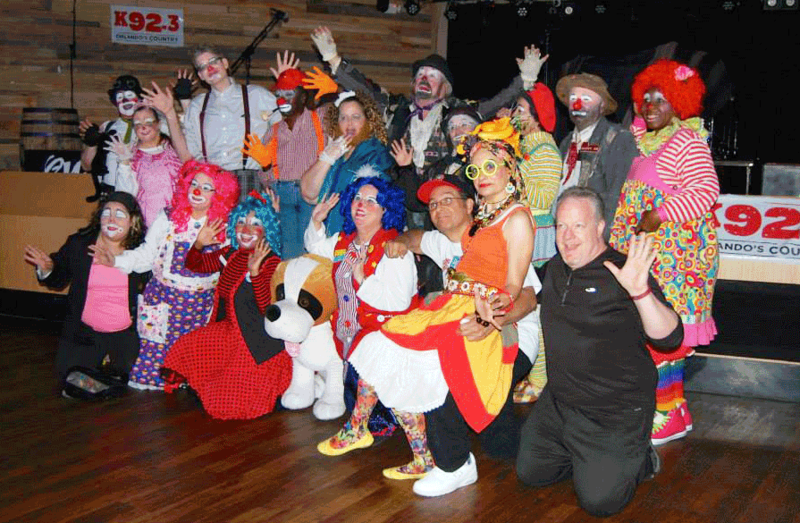 Our 12-Week clown school covers the clowning basics which include character development, how to look, walk and act like a clown, basic performance skills, costuming, makeup, skits, walk-around activities, improvisation and more! For ages 16 and up! Cost of $150 per person includes makeup, props, study materials. 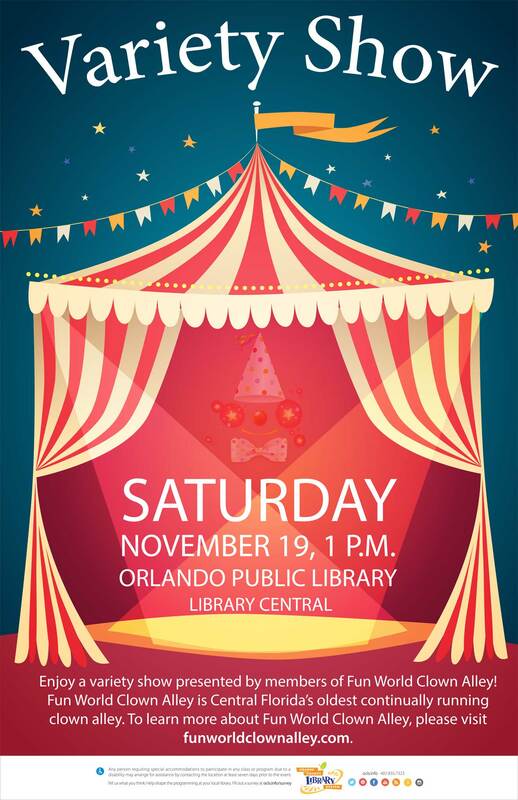 Please click the CLOWN SCHOOL link above for registration or more information! Thinking about becoming a clown? Then please join our mailing list and we’ll contact you when registration opens. We have no details at this point but will post something as soon as we do! President: Fun World Clown Alley, Inc. Learn to Play… AGAIN! – Clown School Starts Soon! 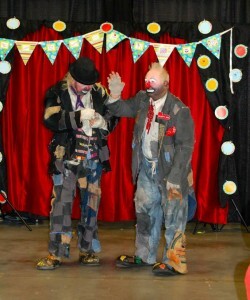 From the first day of Clown School, you’ll be working on stage presence with students and other alley members. You’ll take turns doing exercises, while having a chance to give and receive feedback. Clown school is a safe place to learn how to “play” again! CLASS START February 29th – SIGN UP TODAY! Clowning – A Great Activity for Couples! Burns and Allen, Ricky Ricardo and Lucille Ball, Abbott and Costello, Laurel and Hardy – Clown duos are great ways to play off of each others’ talents and have fun and make a difference in the world at the same time. 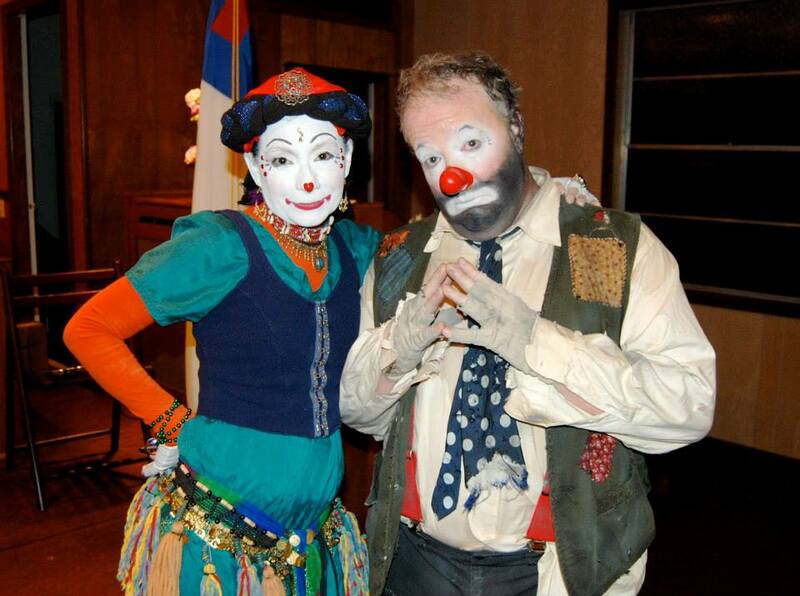 Learn the basics of clowning at CLOWN SCHOOL which covers everything from makeup and costuming, to improvisation, character development, skit development, stage presence, movement and MORE! Our 14 Week school starts soon! – Learn more HERE. 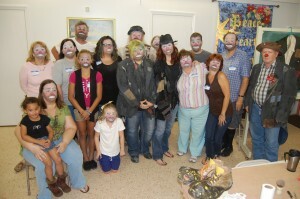 Find Your Inner Clown at Clown School! Improve your self-confidence with IMPROV! – At Fun World Clown School! 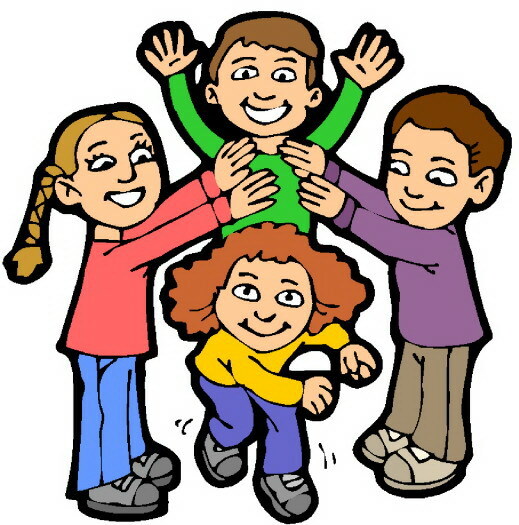 Improv and play are proven to help with shyness and increase self-confidence and self-awareness. We start almost every clown school class with a half-hour of warm-ups and exercises designed to help students increase their skills in those areas. ! 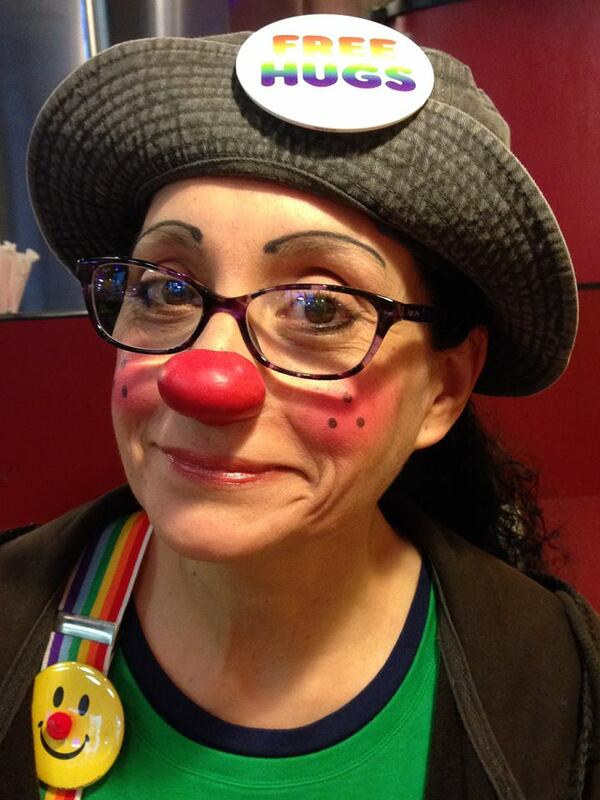 2016 Clown School Registration Now Open! 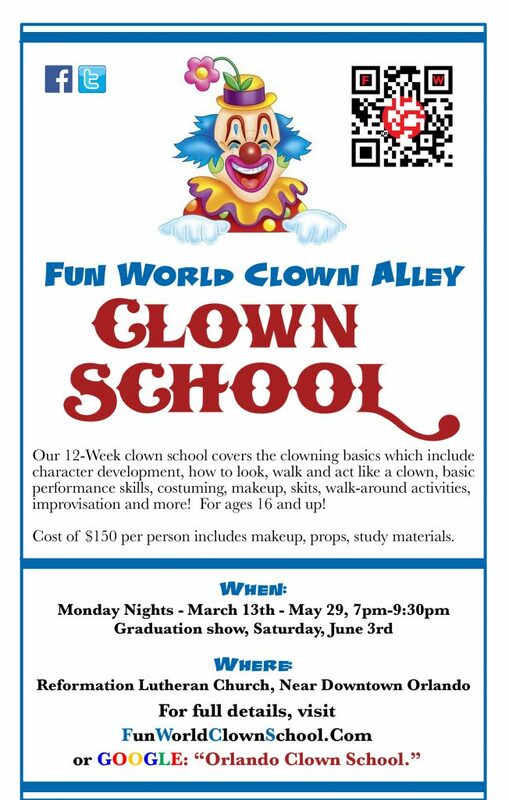 The Fun World Clown Alley Clown School is now filling slots for it’s 2016 school session! If you’re already sure you want to register, simply click HERE to go to our registration screen. Otherwise, please keep reading! With almost 40 hours of education and play over 14 weeks, we’ll cover all the basics of how to BE a clown, not just how to look like one. Utilizing instruction from experienced clowns and instructors from both inside and outside of our alley, we focus heavily on improvisation, character development, movement and stage presence, and cover all the basics of makeup, costume and skit work. NOTE: Our curriculum primarily focuses on how to be a clown on the inside, and so we do not cover things like balloon twisting, face-painting or ‘clowning as a business’ in class. But we DO cover those topics after graduation as part of our regular clown alley meetings. READY TO SIGNUP? Click HERE… Or for MORE information… Click HERE.